I was as happy as a kid when I awoke to see this season’s first serious layer of freshly fallen snow. It meant I could officially launch my recently acquired winter bike – this handsome red model purchased from Re-Cycles on Bronson. For the last couple of weeks it’s been prepped and all set to go. I was not disappointed – I love it. It’s a slower-as-she-goes ride (heavier bike, wider tires with studs on the front, snow & ice, etc) than on my summer bike, but great for getting around in our wintry climes. 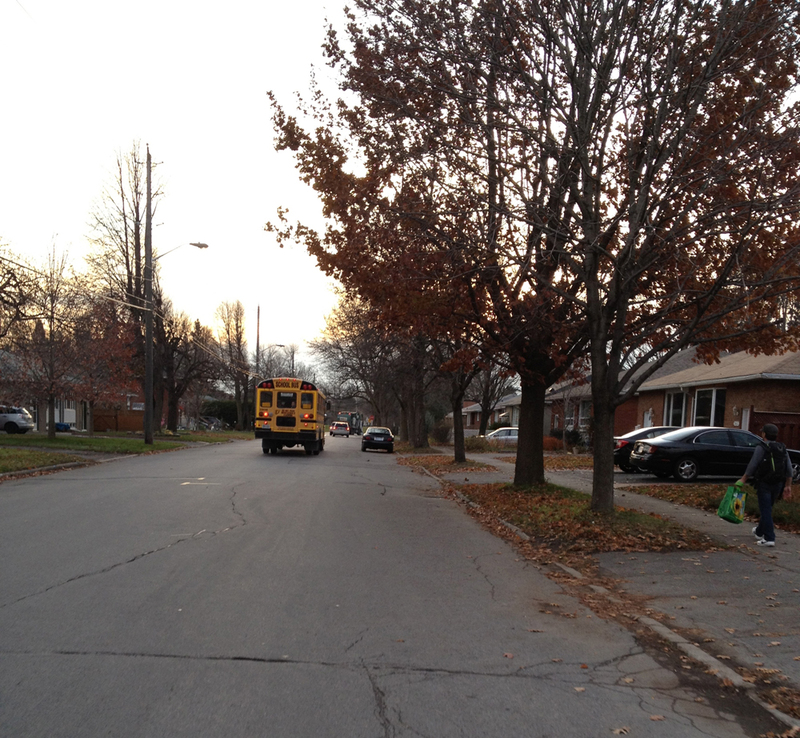 Here’s a short route to get things going which I followed after walking my son to school. 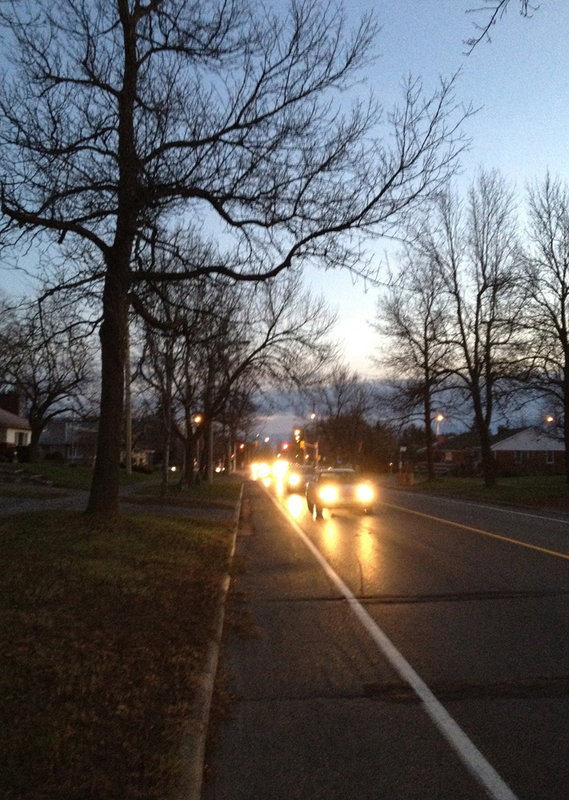 Somerset between Bronson and Preston is pretty tight even on a snowless day. This is my favourite way of getting around it. at the eastern end of the Somerset O-train bridge there’s a little road that curls under and pops out near the old commercial area called City Centre. 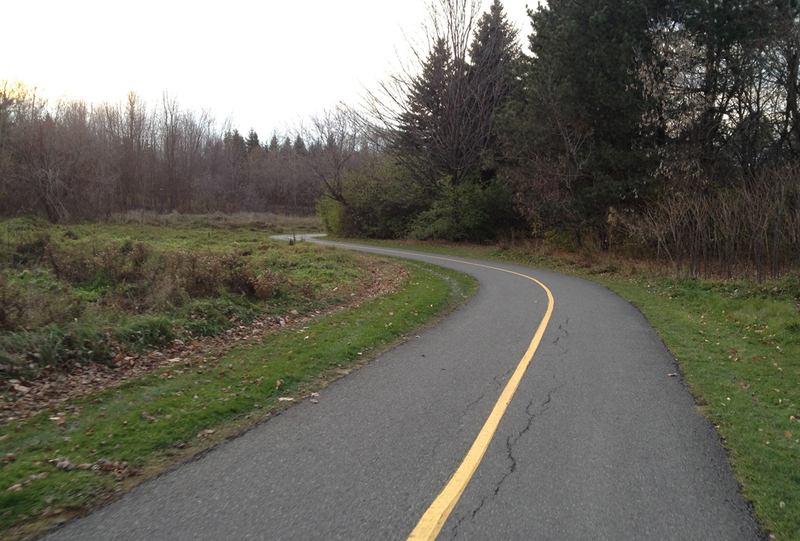 UPDATE – Dec 2014 : The O-train bike path has since opened and this season it’s being cleared of snow, offering an alternative to having to using the mini-underpass with trucks and cars. The orange line on the above map is the suggested O-train path detour. Elm Street a couple of blocks down is a quiet street. That’s because it’s blocked off to cars half way to Preston. But not to bikes. Preston has a cross walk signal, as does Booth when you get to it. Very nice. A bit up Primrose you come face to face with Nanny Goat Hill (or cliff). The flight of stairs is very manageable if you don’t mind carrying your bike a bit. At the top of the stairs there is a cleared path that goes the rest of the way up to where Primrose continues on. Going this way allows for a good close look at Dominican University College, which was built in 1899 as a Dominican convent, and continues to function as a Monastery as well as a college. This is where the guys in brown robes walking along Somerset hang out. UPDATE – January 2015: I am now riding a single speed bike with narrower tires on a 20+ year old steel frame. Changed bikes because in cold weather the pawls on the rear hub (little ratchets that allow you to freely pedal backwards) on my previous multi-speed bike would occasionally freeze and not allow me to pedal forward. Bought the wheel at MEC, the single speed sprocket and studded front tire at Tall Trees, and assembled the whole bike at Re-Cycles. 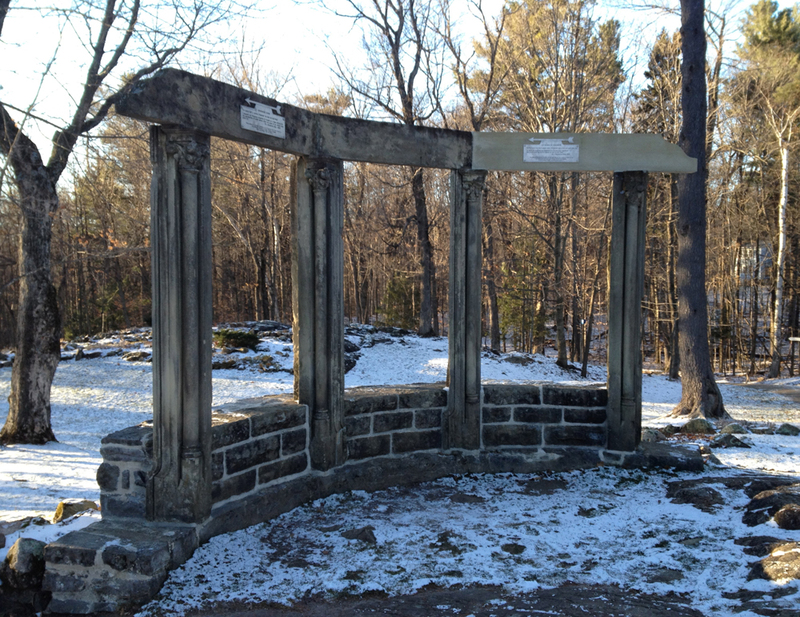 While composing the last post I was reminded of Prime Minister Mackenzie King who collected a number of old ruins and selectively placed them throughout his property in the Gatineau Hills. So I decided to bike up and pay them a visit. It was the first time I had taken advantage of the Gatineau Parkway being closed to traffic for the season, and it was fantastic. Lots of folks walking, jogging, biking, out having a great time. The Parkway is closed to cars north of the visitor parking indicated by the P on the following map. 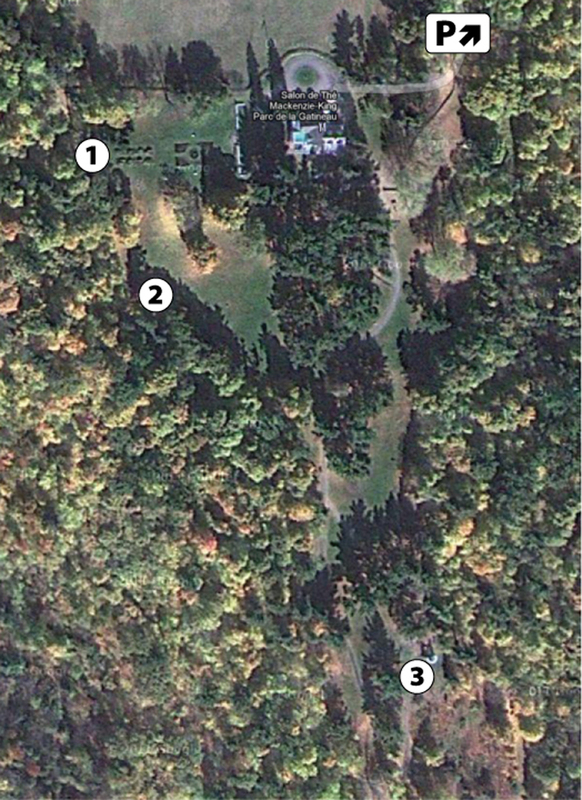 Here’s a map showing where the various ruins are located up at the estate which is open to the public. 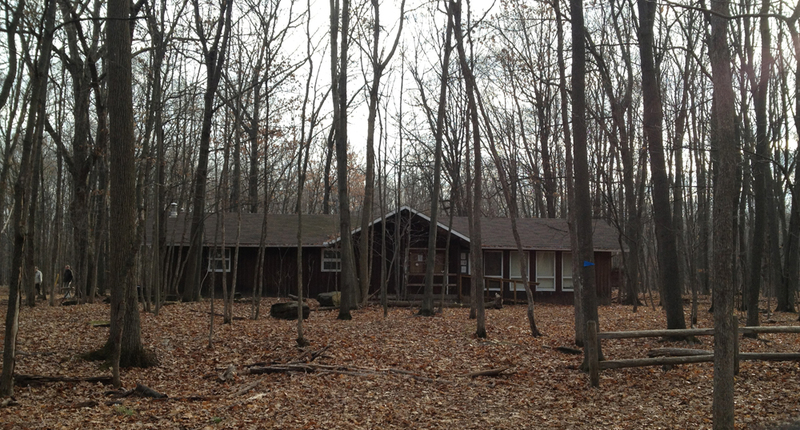 1) The first is this bay window on the edge of the woods. 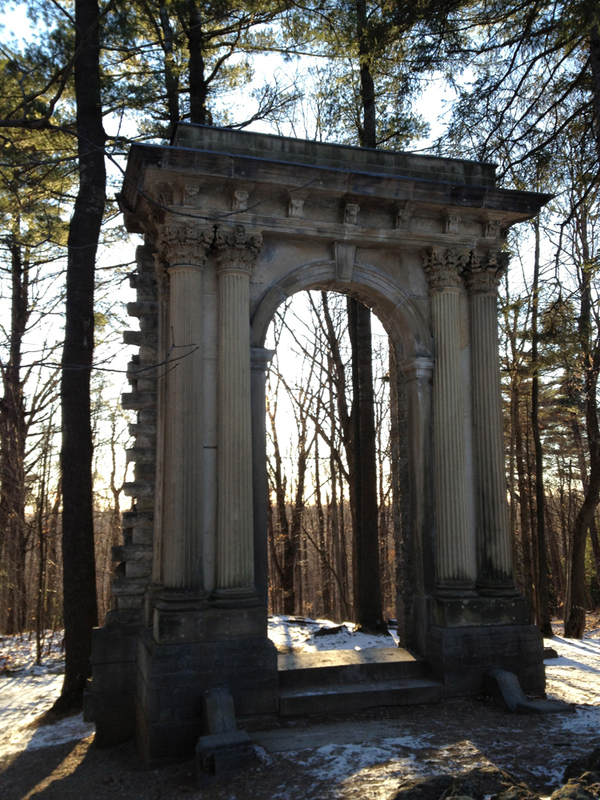 2) A bit further along stands this majestic arch. Love it. 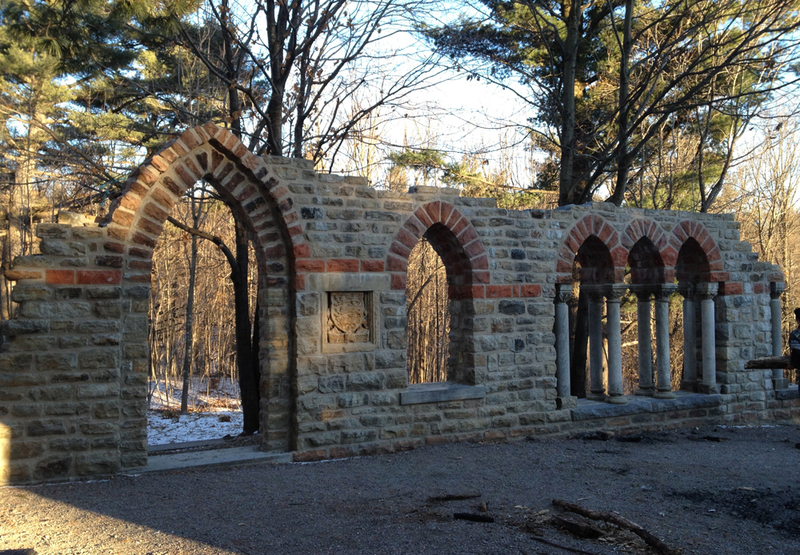 3) On the crest of a little hill sits an assemblage of architectural details Mackenzie King named the Abbey Ruins. Here are the various pieces that make up the Abbey Ruin. 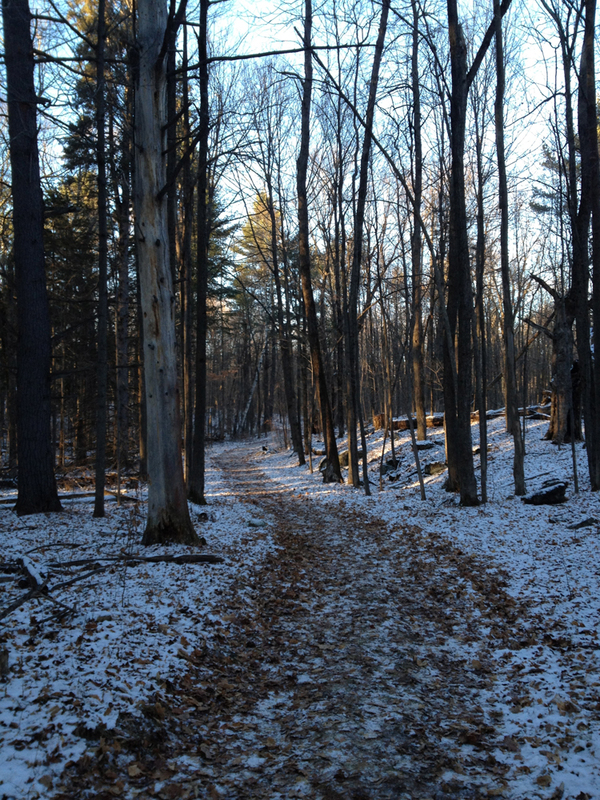 I end this entry with a shot of the trail through the woods between the Abbey Ruins and the Mackenzie King Estate parking lot. Over the course of my local velo adventures I’ve happened upon a number of old architectural ruins selectively placed throughout the city. On Saturday I re-visited three of them. Here’s how the grand tour panned out. 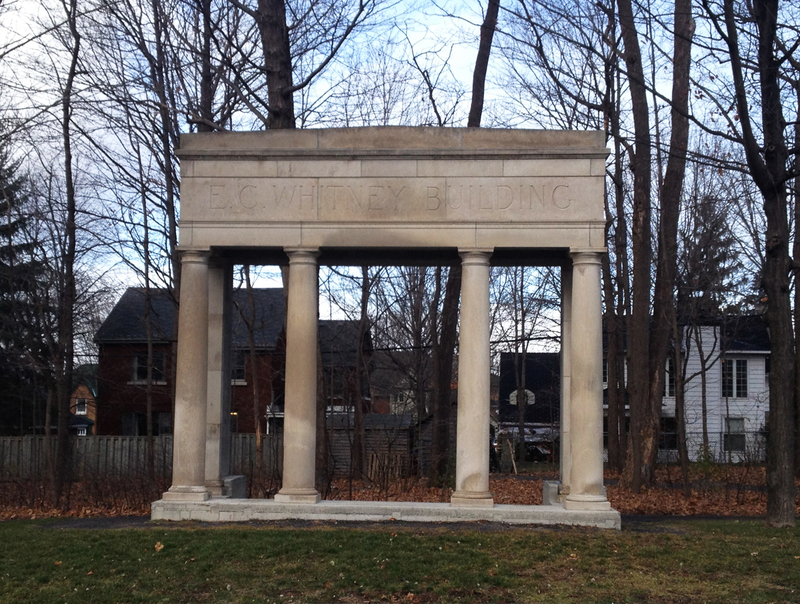 The first, located behind the Royal Ottawa Mental Health Centre, is this handsome entrance to what was once the E.C. Whitney Building. I can’t find a description of the original building, or who E.C. Whitney was, however there was a successful general manager of a wood mill in the township of South Algonquin community of Whitney by that name who appeared on the scene way back in 1895. 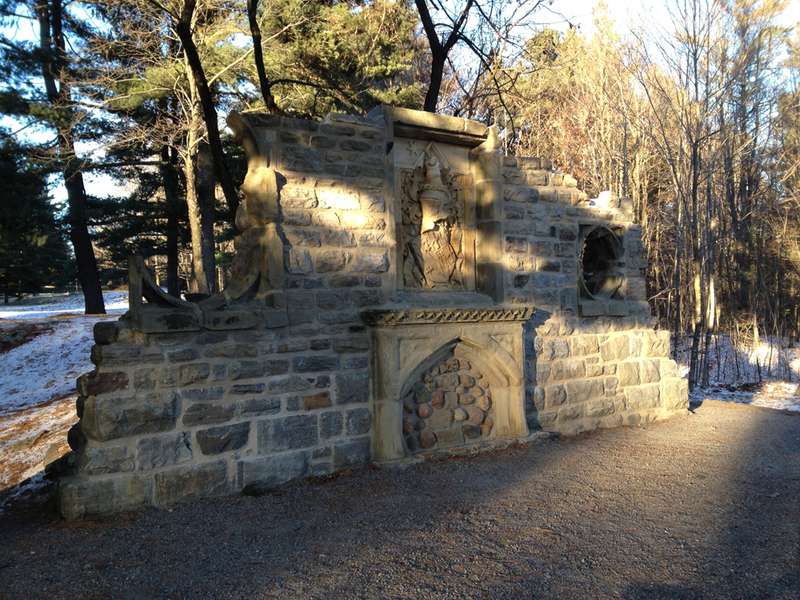 Next stop brought me to the edge of the Rideau River near Bank St where this commemorative wall is located. 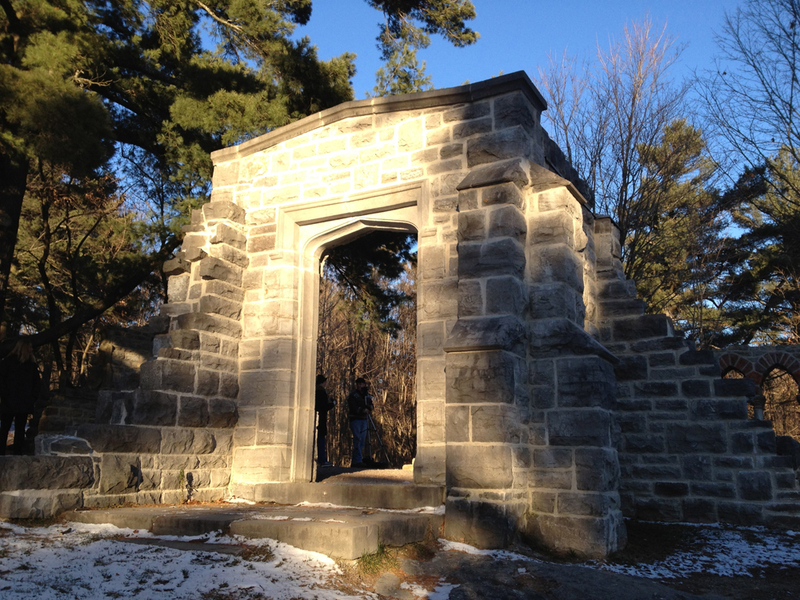 It is constructed of stones that formed part of a blacksmith’s fireplace dating back to 1814, which was disassembled in 1960 to make room for road construction. 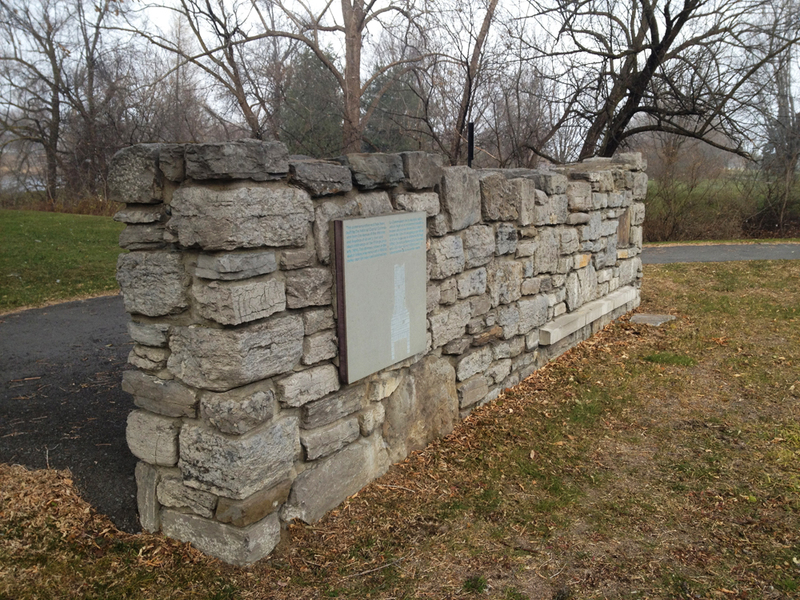 Two interpretive plaques are mounted on the wall, one facing the bike path which includes a rendering of the original fireplace. The other plaque is attached to the other side, and describes Braddish Billings on whose estate the blacksmith shop was situated. 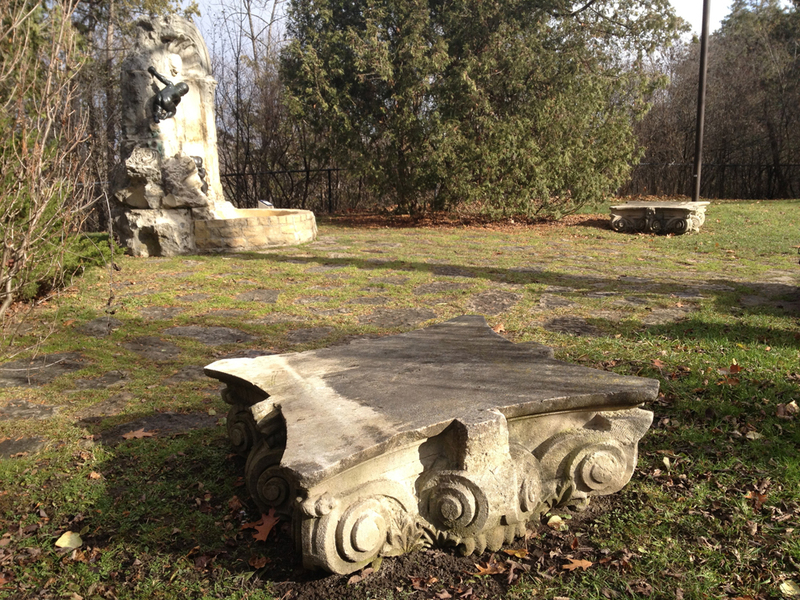 The last bunch of ruins on this tour can be found in Rockcliffe Park just east of Acacia Avenue. They are my favorite. 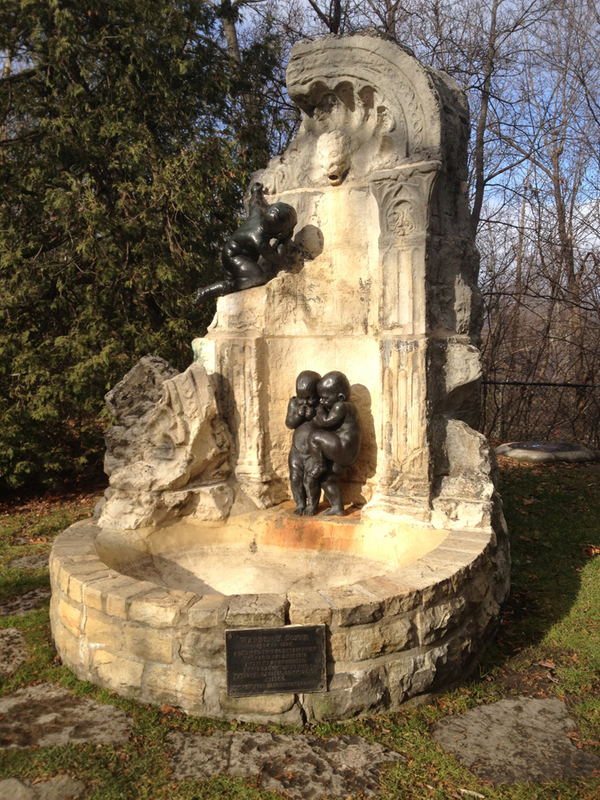 This fountain is actually a faux ruin. It was designed by the sculptor René Bertrand Bouté 1912 to look like one. But who’s splitting hairs? I love it. 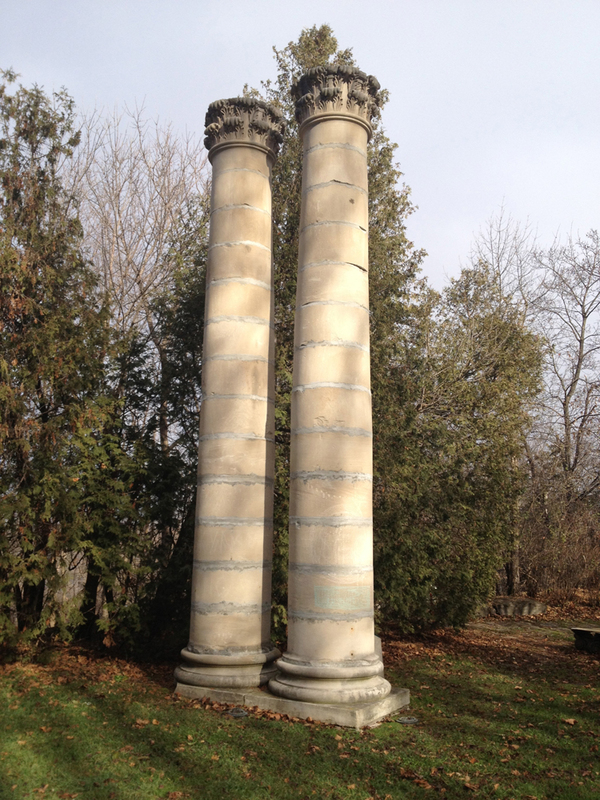 These columns come from the Carnegie Public Library, which was located at the corner of Laurier and Metcalfe from 1906 to the early 1970’s. 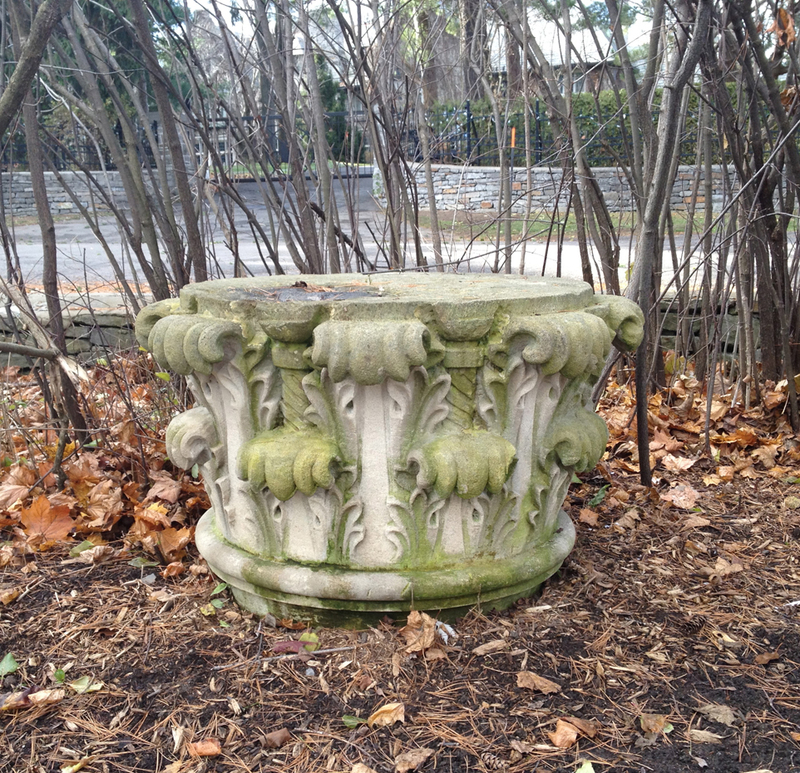 I think this tumbled column and the scattered capitals near the fountain come from the same building. This variation of a Corinthian capital, located away from the other ruins near Acacia Avenue, reminds me of the sad legend describing how this architectural order came to be. 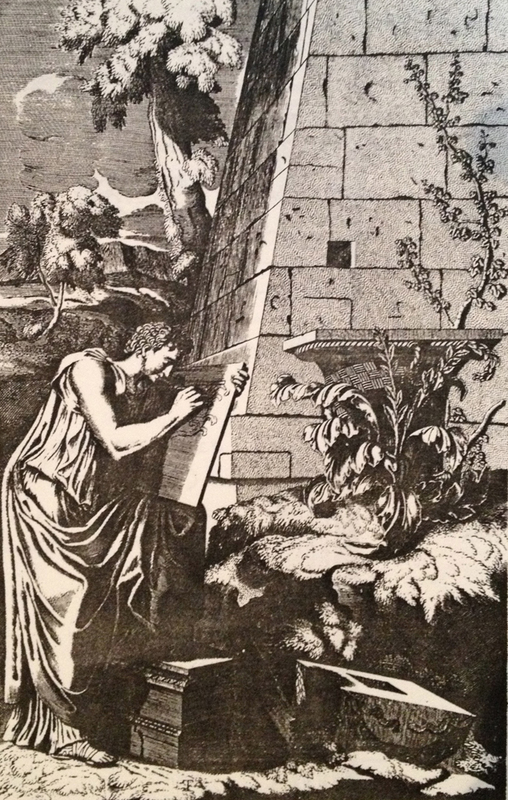 I’ve included Vitruvius‘ telling of the story below the photo. The spirit of the Colonel lives on! 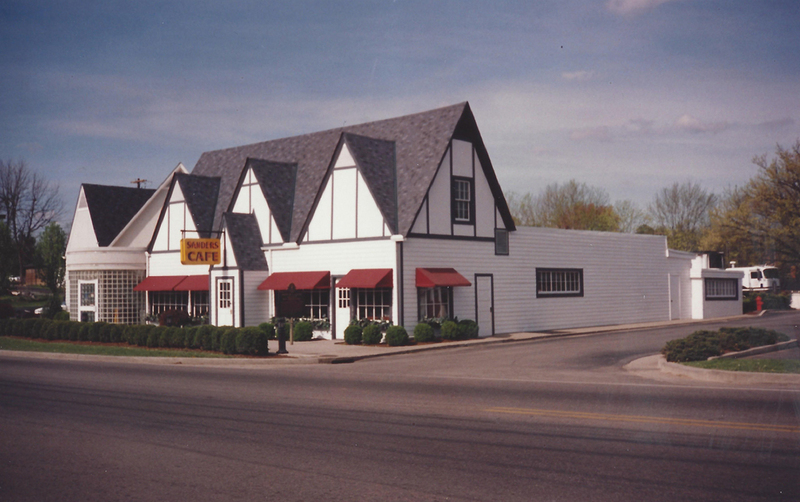 KFC’s birthplace in Corbin, Kentucky. As this interpretive plaque explains, Harland tried various careers with little success before catching his groove cooking chicken, and the rest is history. The Colonel’s story cast in bronze. Now of course KFC is a gargantuan fast food enterprise, but in one of its transitional phases from monstrous to gargantuan, it unloaded many of it’s trademark outlets that looked like this. 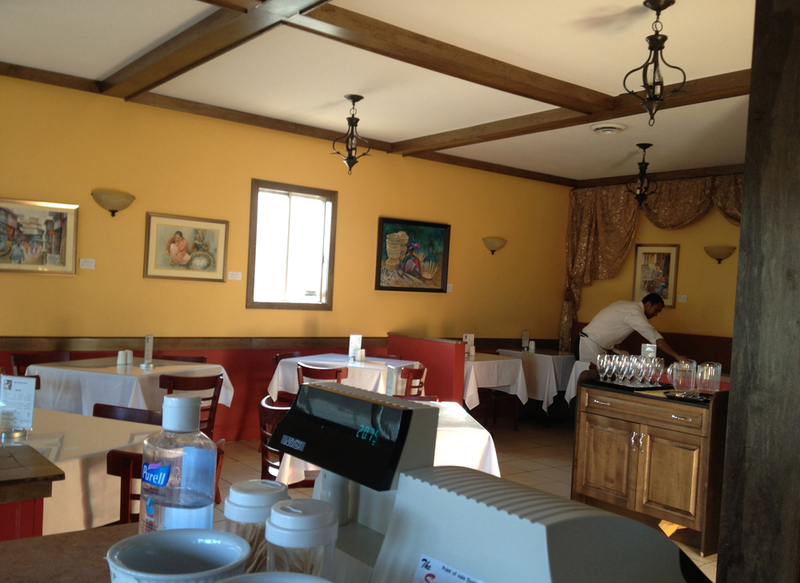 Over the course of my local bike ride adventures I’ve noticed three outlets have been converted into small, one off restaurants, just like the Colonel’s first digs so many years ago. SO, I decided to visit all three, with a couple of extra stops along the way. First stop, Ottawa U’s Academic Hall. Built in 1901, it is the oldest theatre in the National Capital Region. 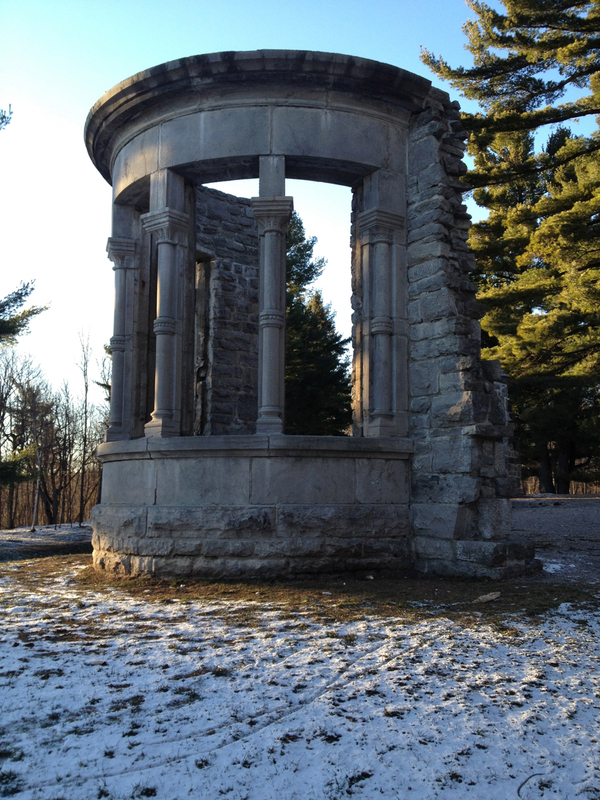 On my way to the first ex-KFC, I paused to photo this panorama from the centre of Parc Jules Morin. This is also Angel Square, popularized by Brian Doyle in his story of the same name, and adapted to the stage by Jan Irwin. 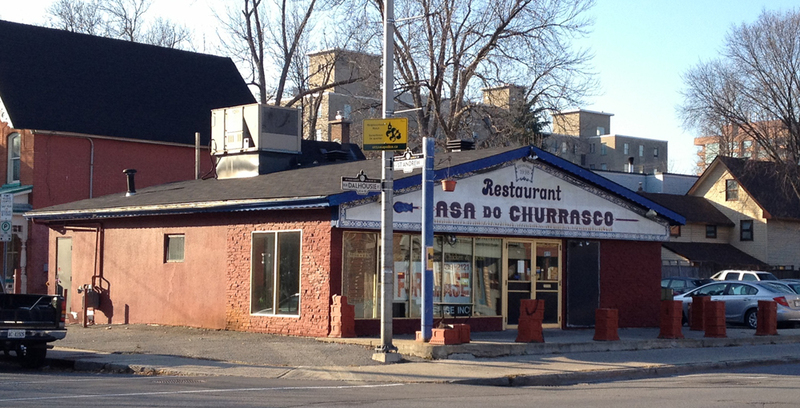 Casa do Churrasco, at the corner of St Andrew and Dalhousie, once served up yummy Portuguese food. Unfortunately it didn’t survive. 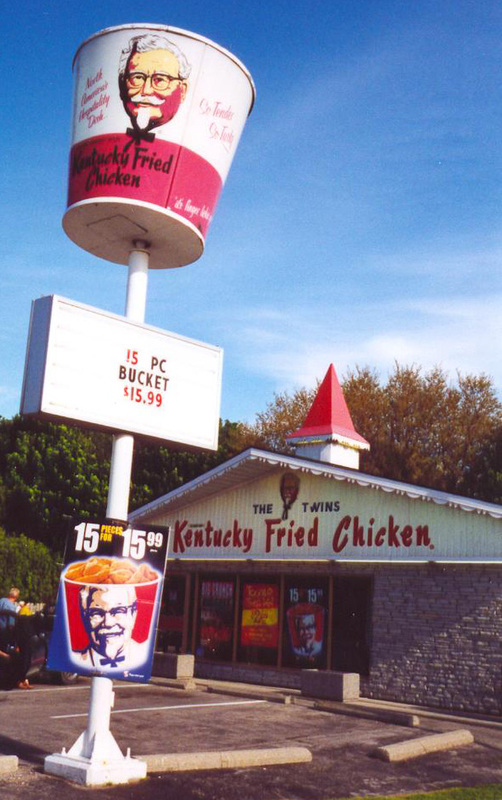 In its KFC conversion they removed the big bucket sign but kept the sign post to use as a planter holder. I headed down the path behind Majors Hill Park, but someone left all the canal locks open, except the top most one near Sappers Bridge. Usually one of the two lower ones are closed, providing access to the other side. No problem. 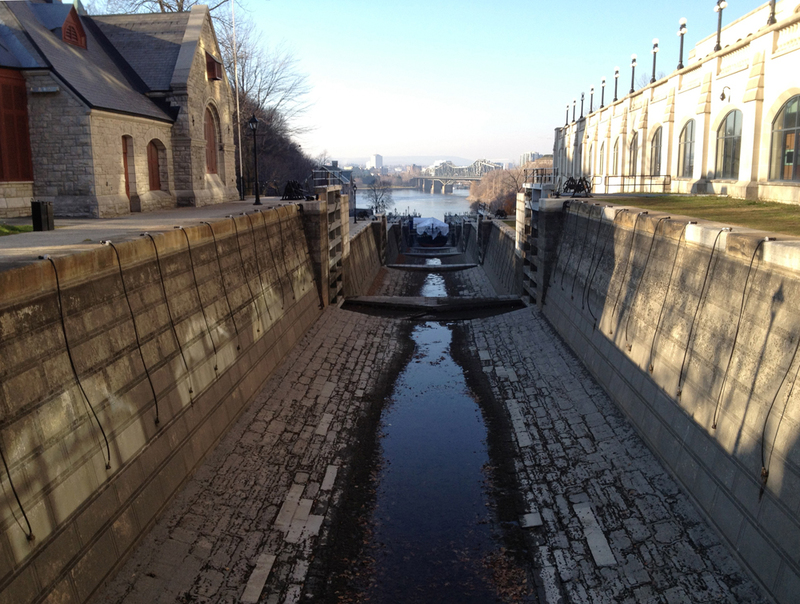 It just meant climbing all the way up to the top of the locks, affording me this wonderful view back down to the river. Next stop: Hintonburger. Lots has been written about this new kid on the block. They haven’t even taken down the big bucket yet. (Update, August 6, 2013 – They took the bucket down). 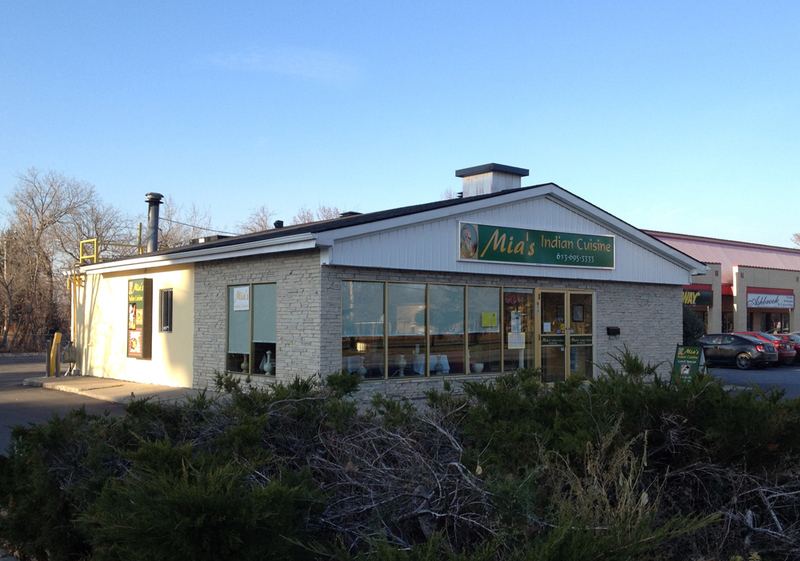 My final ex-KFC destination was Mia’s Indian Cuisine further west on Richmond Road near Woodroffe. Richmond hasn’t much of a shoulder on the north side to ride on and traffic can be pretty speedy in this area so I followed the winding path straddling Richmond and Byron. Samsu Mia is a refugee from Bangladesh. His story, and how he and his family managed to start up Mia’s Indian Cuisine restaurant in another converted KFC outlet, can be found in this CBC report by clicking here. 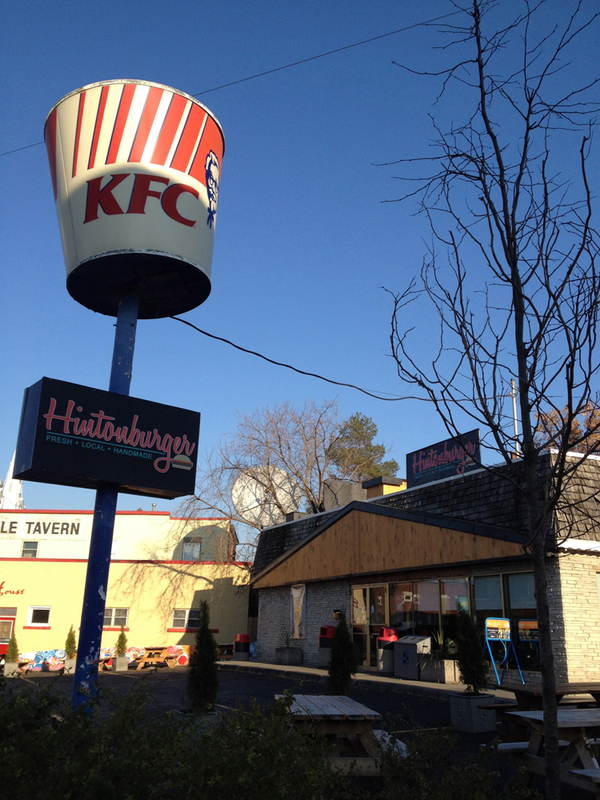 There’s even a bonus photo of the original KFC included in the article to compare to how it looks now. I ordered a couple of vegetable samosa’s and onion bhaji from the take out menu to share with Carla and the kids. It’s all I could fit in my handle bar bag. So there you go. Two out of three successful Kentucky Fried Phoenixes risen from their ashes! Author ottawaveloPosted on November 24, 2012 June 15, 2014 Categories Art & Architecture, Ottawa2 Comments on The spirit of the Colonel lives on! The last time I biked through the Greenbelt Stony Swamp Sector, many of the trails were closed due to wildfires in the area during this summer’s prolonged dry spell. I promised myself I would return once some of the trails were re-opened, so today I did. The blue line on the map is the route I followed to get there. Red line is how I got back. 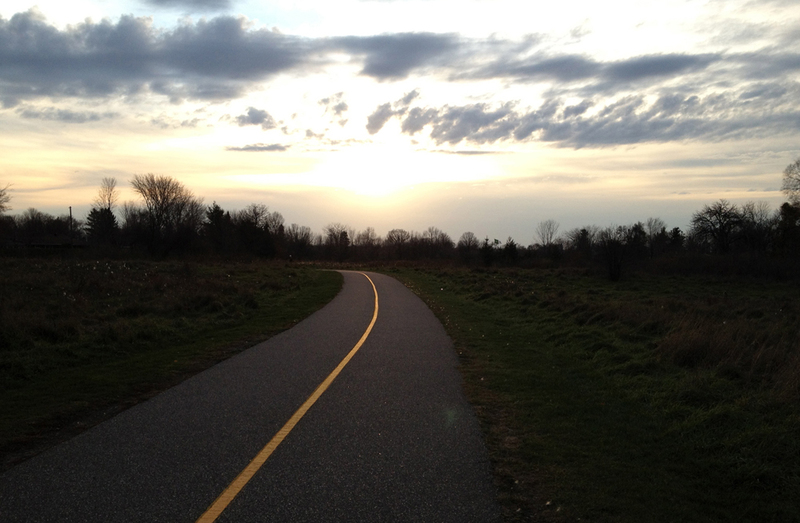 I joined the Greenbelt trail network after crossing over highway 416. The ecological diversity in this area is remarkable. 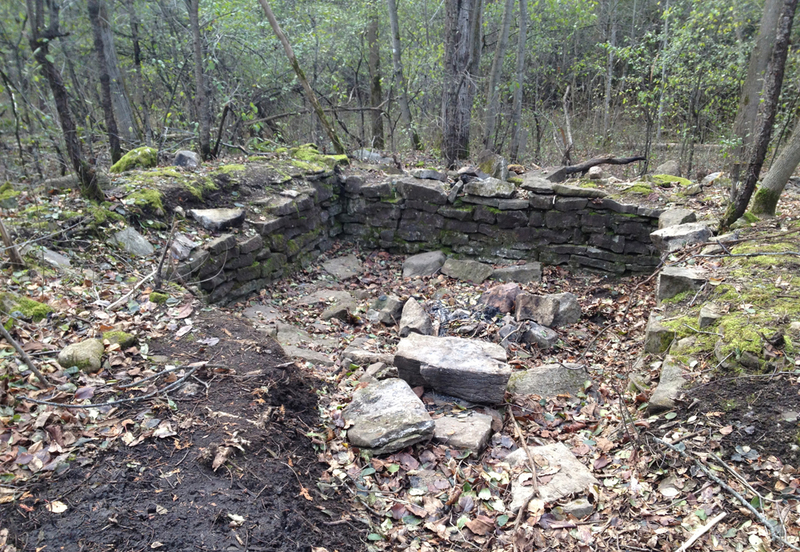 Along the section of trail between Highway 416 and Moodie Drive I noticed this old stone pit someone had recently used to have a campfire. 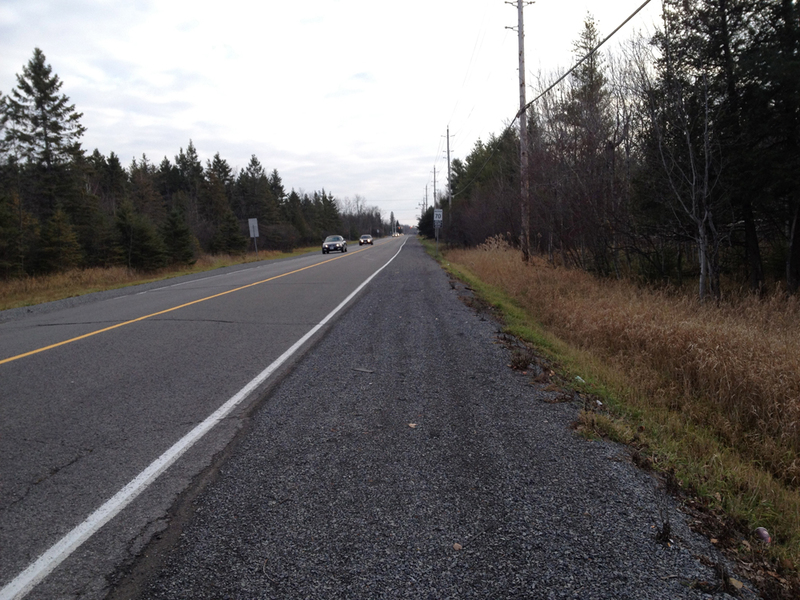 I followed Moodie Drive to get to the trails west of Moodie. This wide gravel shoulder wasn’t too bad for the short distance I had to travel. 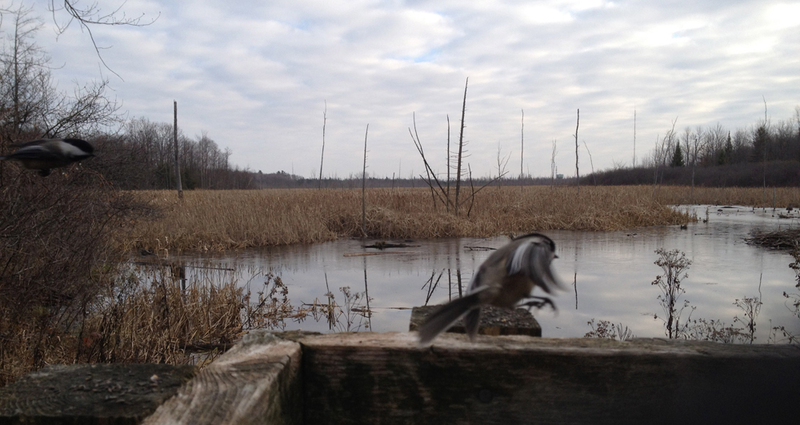 Just beyond the trailhead sits this wild bird care centre. 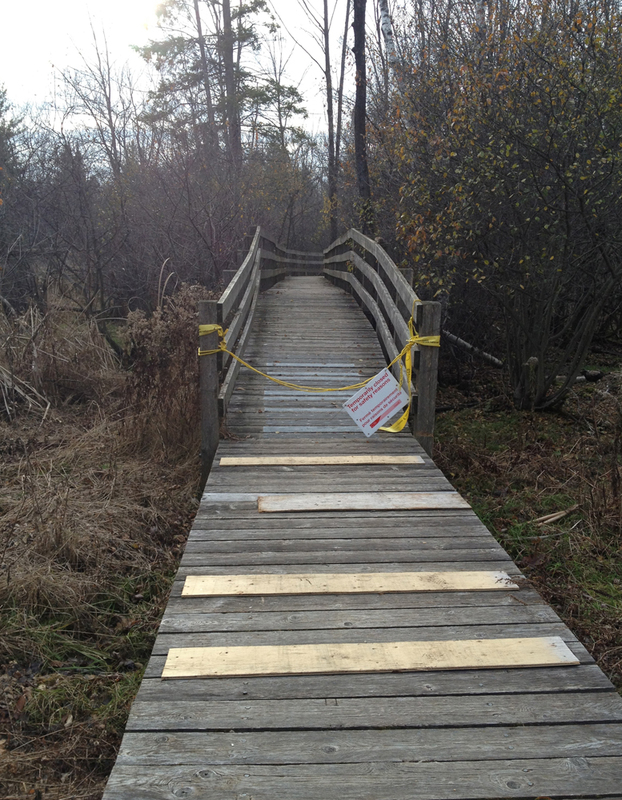 There are a couple of board walks along the trail that look out onto beaver ponds. 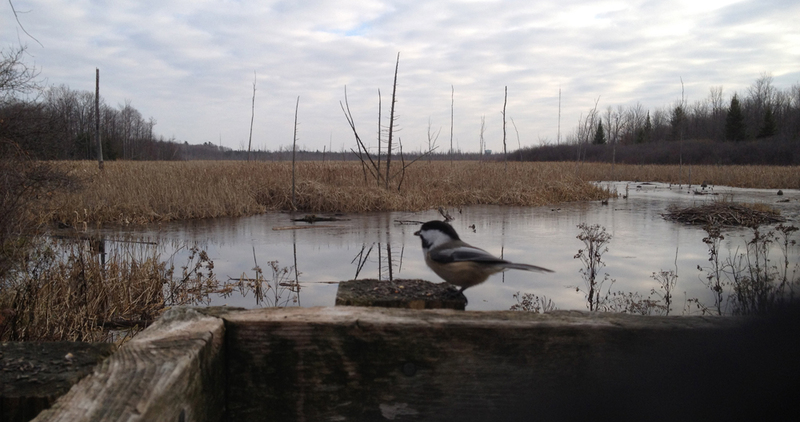 This particular spot must be popular for feeding chickadees. I had only to pause for a moment before these bold little guys were all around me. I happened upon lots of people holding out their hands onto which the birds would land, pluck a seed and then fly off. Unfortunately not ALL the trails are open yet. I guess they are still cleaning up after the fire. 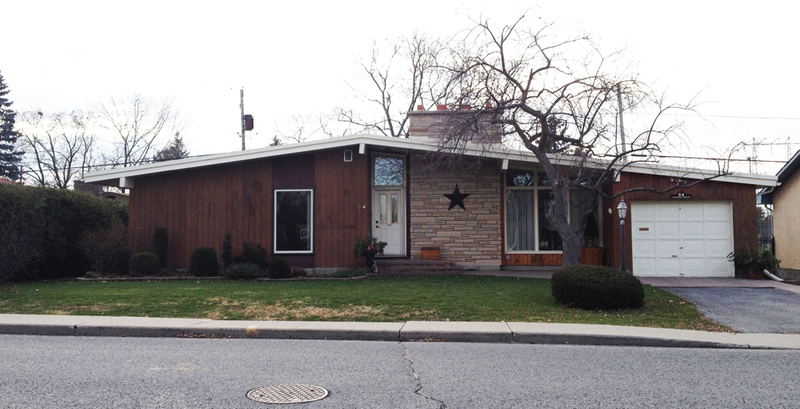 On the way back I biked through the residential area called Bells Corners East which appears to have been built up in the 50’s and 60’s. This house has retained much of it’s original detailing. I’ve seen similar big stars on houses through out the country, particularly in New Brunswick. They may symbolise something in particular, like the star in the Acadian flag, or they may also be a popular detail from the period. Not sure. 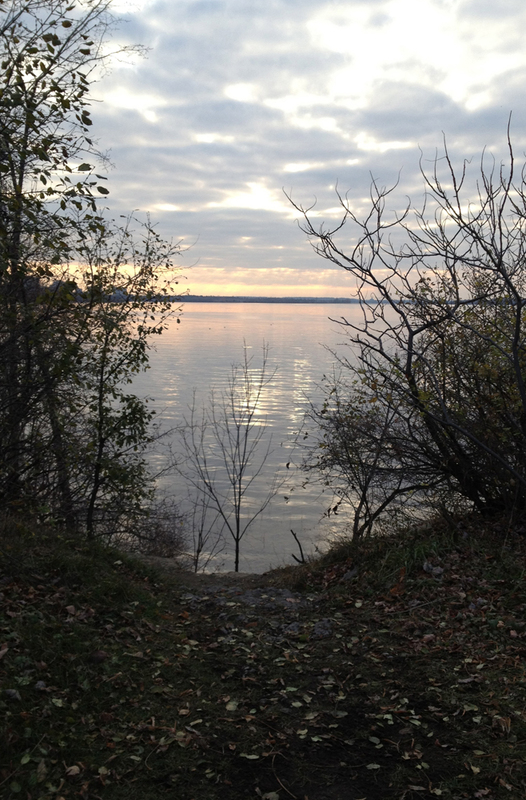 I then wound my way home along the Ottawa River. Monday I had to bike to Ikea. Strong westerly winds made me hesitate. The challenge was to find a route that avoided traffic AND Aeolus. Success! The blue line shows how I got there, red is how I got back. The short pink lines are where I could have gone to avoid the wind just a little bit more. 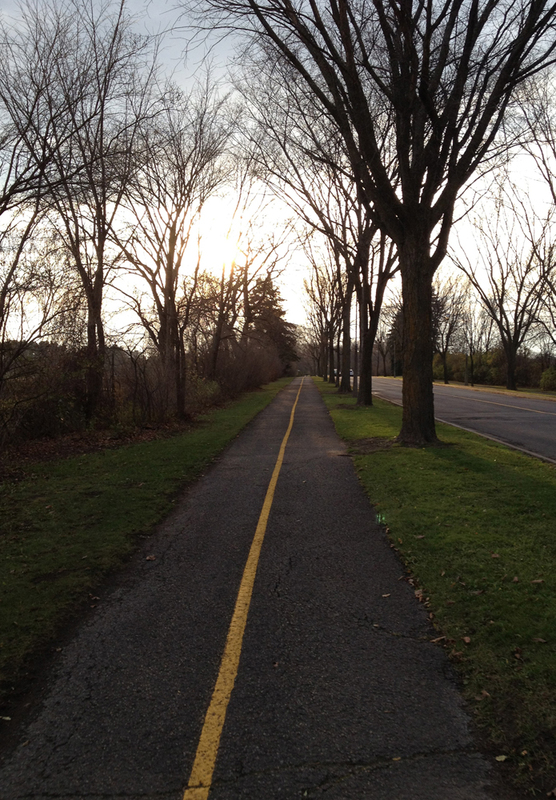 First, head towards the Experimental Farm Pathway via Dow’s Lake. 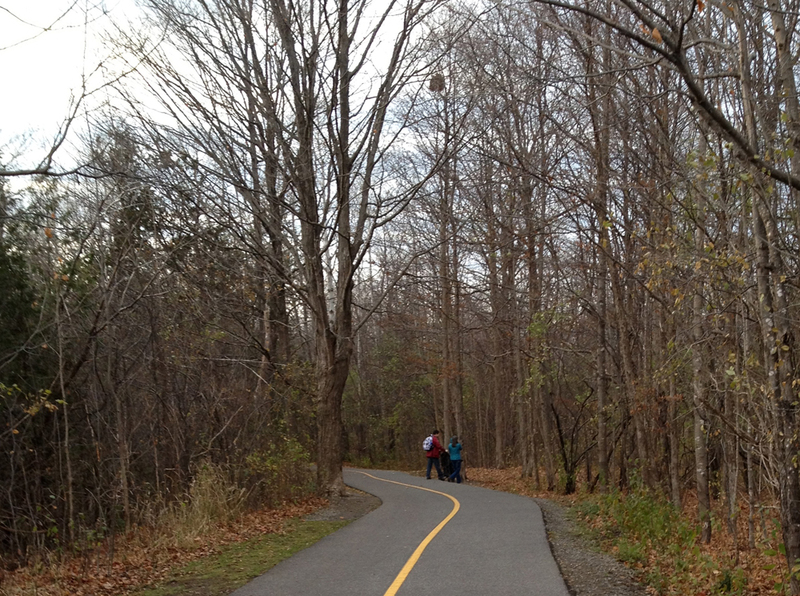 Avoid the open fields by biking along the National Capital Commission Scenic Driveway with tall trees on either side. 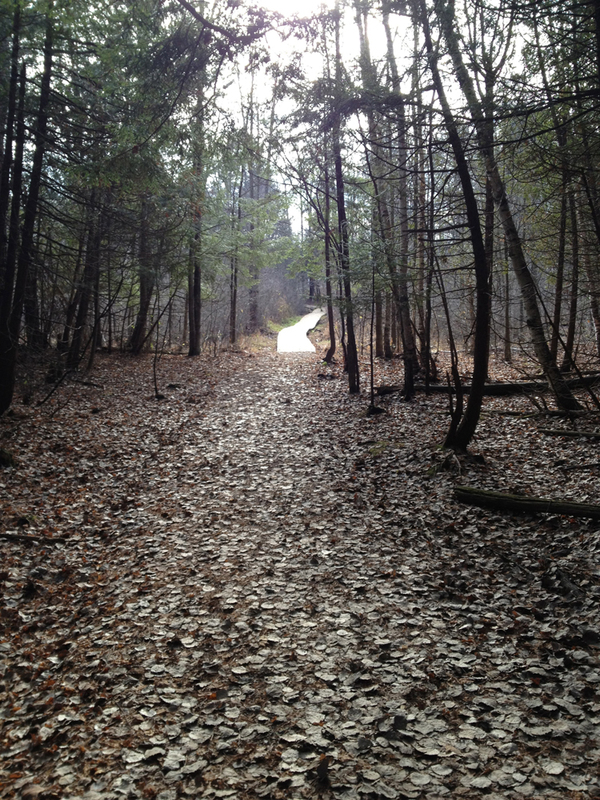 This takes you to a path through what’s popularly known at as the Enchanted Forest that runs along Fisher. The only wind there is caused by the flutter of fairy wings. Beyond Fisher the pathway continues along the edge of the farm. A less windy option would be to follow Kingston Avenue that heads the same way, as shown in pink. 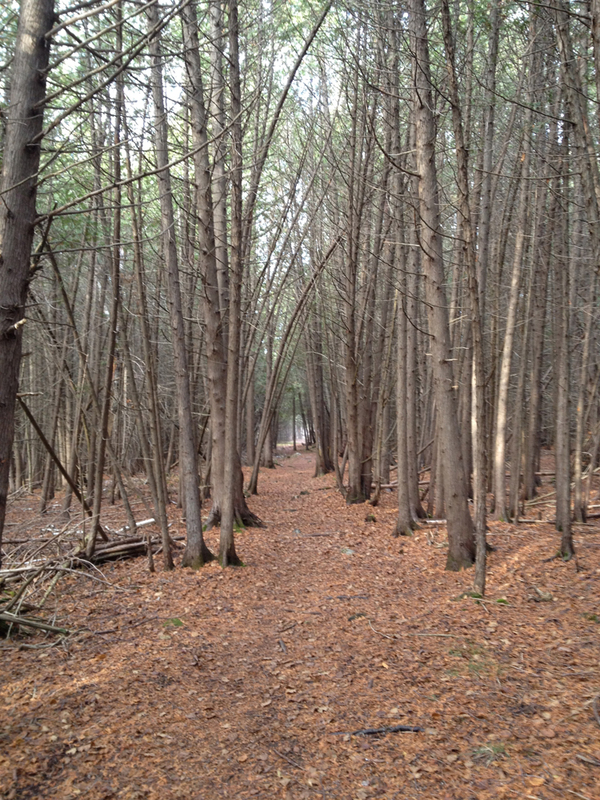 Between Merivale and Maitland the path snakes through a wooded area. All good. 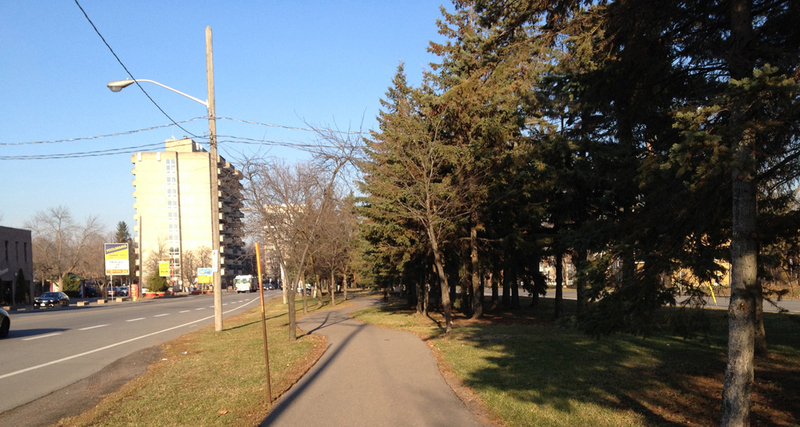 Now the most exposed area along this path comes next – the stretch between Maitland and Woodroffe. On a blustery day I suggest biking along the residential streets hi-lited in pink past this area. But you’d miss this type of view along the pathway. Beyond Woodroffe, the path follows a little valley along a stream. 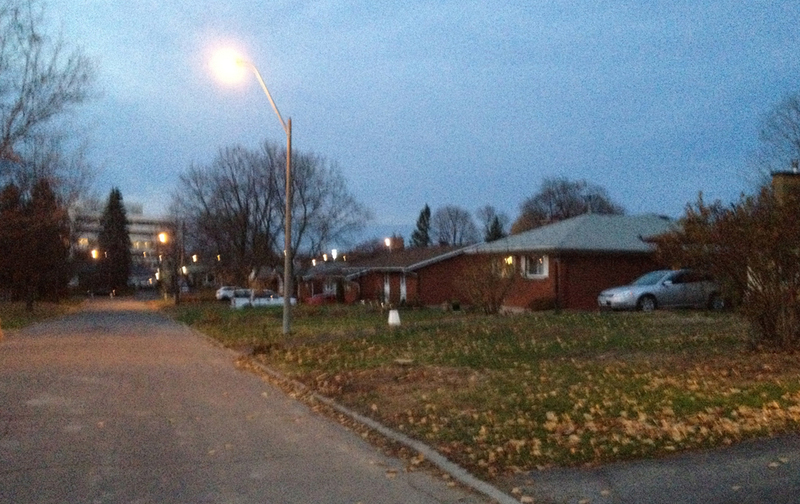 Then ride down Iris Street, which is protected from the wind by houses and trees on either side. That gets you to Ikea. 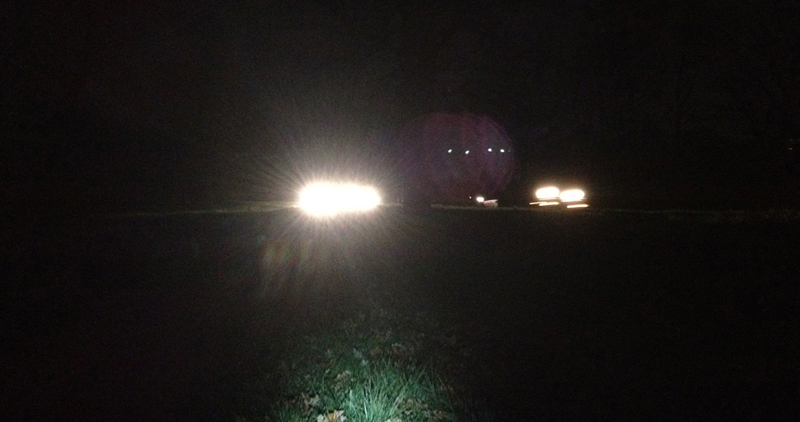 To get home, after checking out Firestone Lane…. 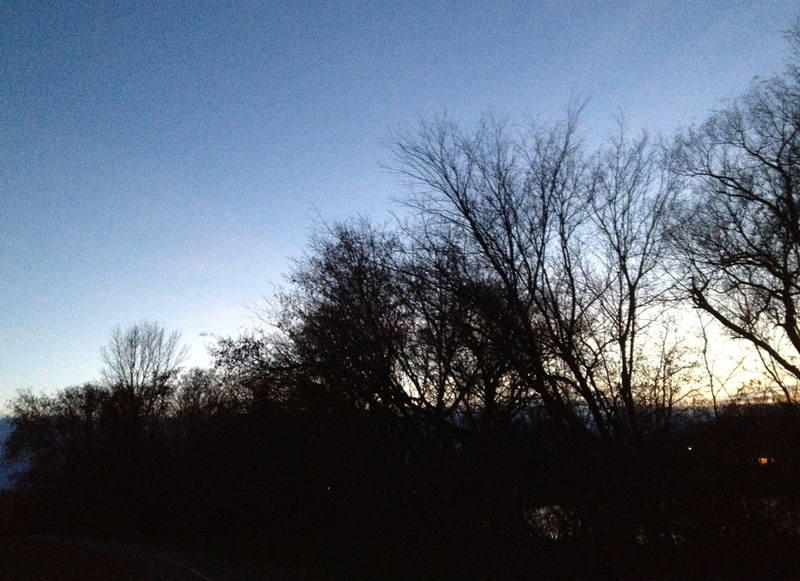 …I re-joined the bike path where it crosses Iris and headed over to the Ottawa River. Now the wind became my best friend! I sailed home. After dark, the oncoming headlights along the driveway are really bright, especially on a moonless night such as it was, but if you don’t let them bother you they make for an interesting contrast between the rush of the river flowing by on the left, while glaring lights rush by the opposite way on your right. My son had an afternoon game out at the Jim Durrell Recreation Centre. I’ve biked there before and wound up going through the intersection of Bank and Walkley which is terrible, awful and terrifying. But today I discovered two ways to avoid it! 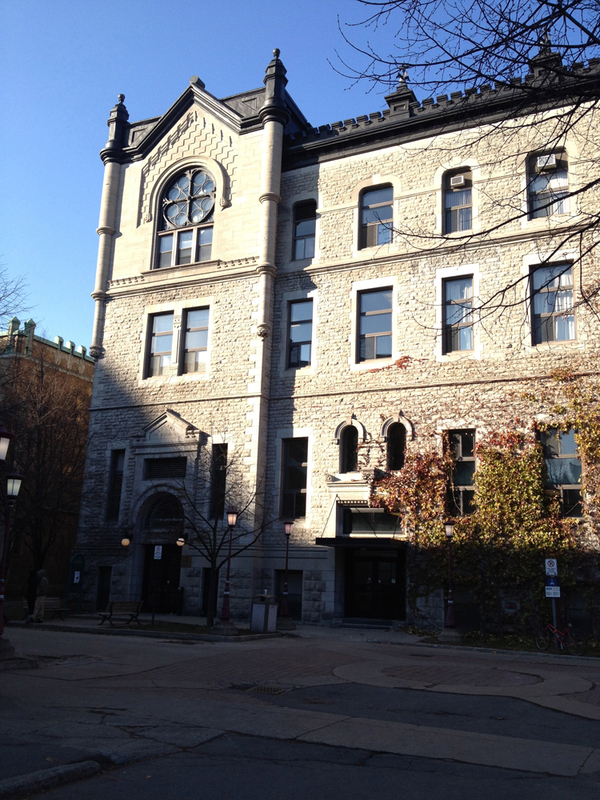 Red line’s how I got there, blue line’s how I got back, with a stop off at La Salle Académique at Ottawa U to help install the latest set I’ve designed for the play Unity by Kevin Kerr. 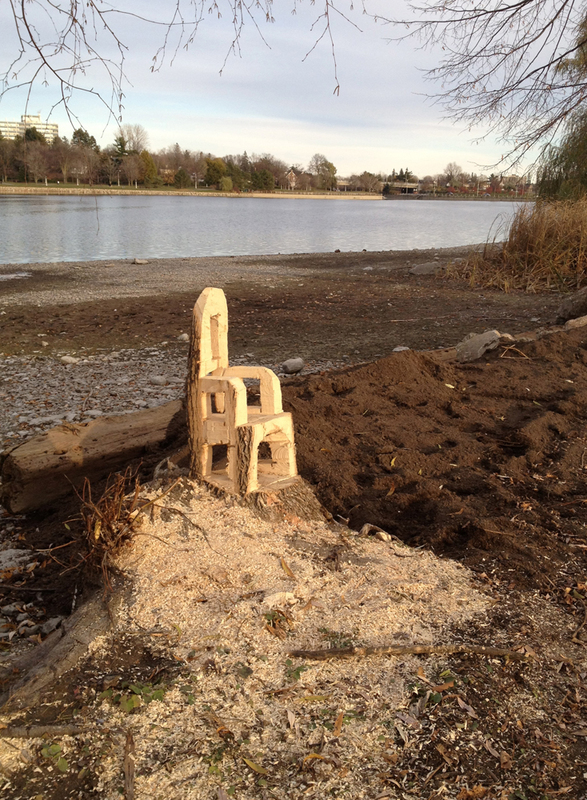 Someone carved this great little chair out of a stump sitting on the edge of Dow’s lake. 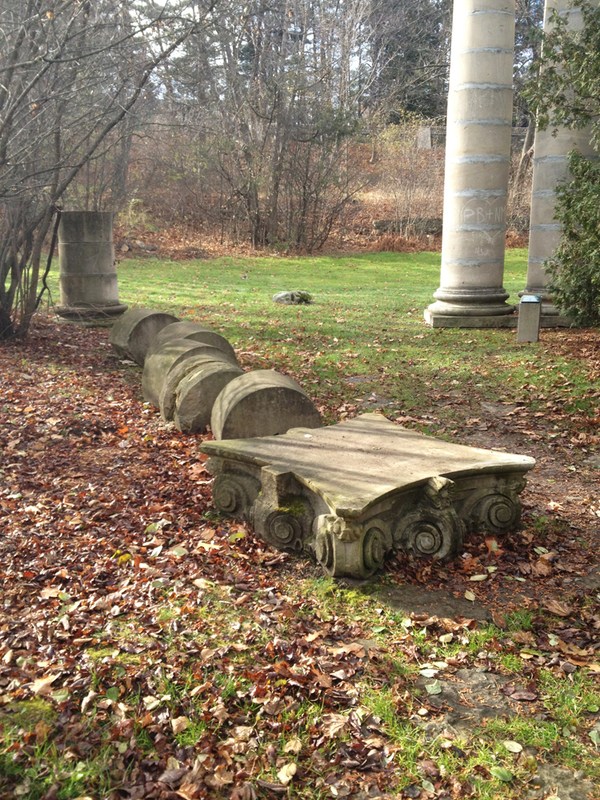 The surrounding saw dust suggests a chainsaw was the sculptors tool of choice. 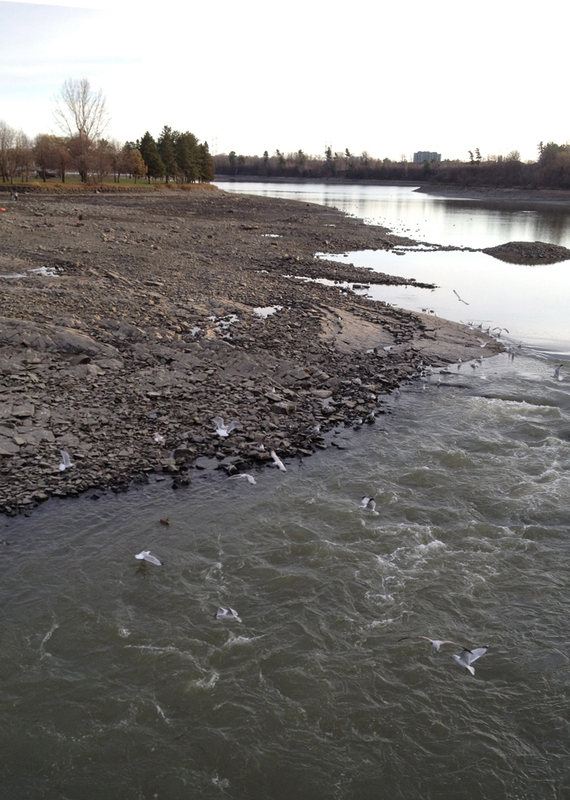 There’s much less water flowing under Hog’s Back bridge these days, exposing the stone river bed. A bunch of seagulls looked like they were having a great time playing in what little water was there. The secret to avoiding the corner of Bank and Walkley when following the Hogs Back route is this section of unmarked path to the south of Ridgemount High School. I was so excited with this discovery that I over shot my mark and had to circle back to get to the Recreation Centre on Walkley. 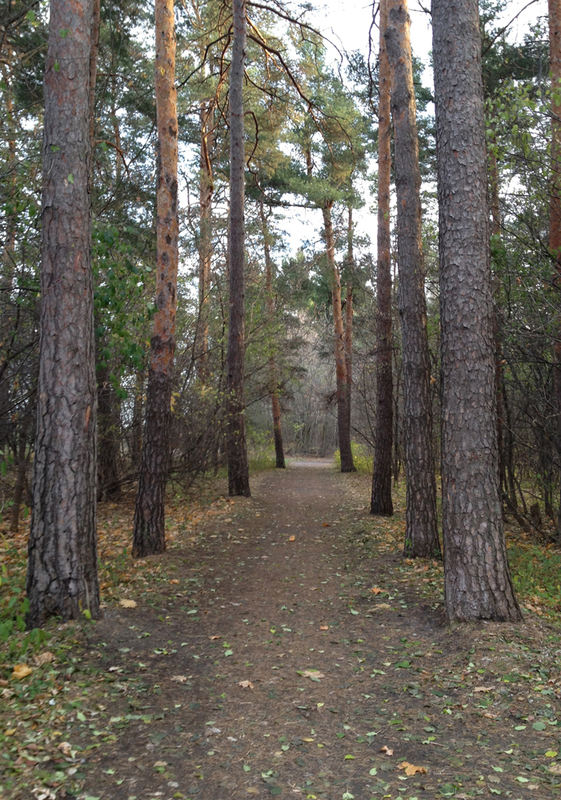 The route I followed back towards the centre of the city after my son’s game (win!) took me along Alta Vista Drive. I was anxious at first, because even though Google Maps said there was a bike lane, Alta Vista has always been a pretty busy street. But ya know, it wasn’t bad! Folks were driving at a safe pace. Maybe the bike lanes help keep things calm. Today’s ride reminded me it’s the crisp air of November and how it holds up rich smells to sample, like burning wood or freshly fallen leaves, that helps make biking at this time of year special. 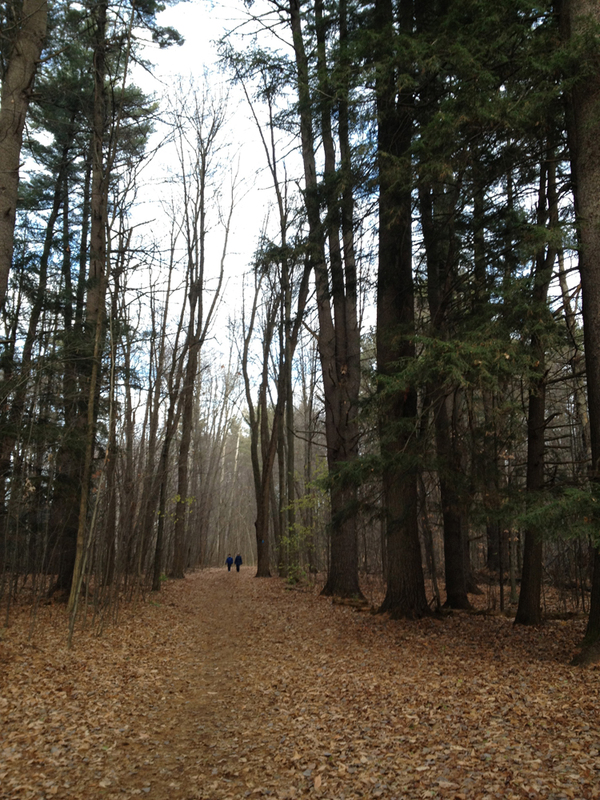 And the rich smells were in abundance biking along the Rideau River.